Property Tax Records for Baltimore City are located on security microfilm and are digitized and cataloged for access by researchers through 1915. The Baltimore City Property Tax Records Guide contains a listing of what is available on microfilm and on which roll it appears. All of this film has been digitized and place online. You will need to know the surname of the person you are searching for, and in some instances, you will need to know the ward and section. The first ten years of the tax records (1798-1808) were indexed for surnames. Our page on Ward Changes is a good place to find ward information, which changed at different points throughout the city’s history. BRG4-1: General Property Tax Books, which were the final tax records for the municipality are available online for the following years: 1797-1915. BRG4-2: Assessor Tax Records were the intermediate records completed by the field assessors and are arranged internally by street. They are available online for the following years: 1800-1867. 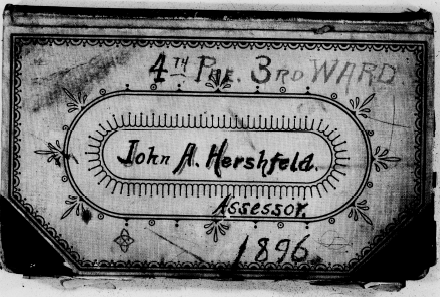 BRG4-3: Field Assessor Work Books were the rough drafts created in the field by the assessors, and include name of owner, description of assessed property, diagrams of property lines, statements of value, etc. They are available online for the following years: 1837-1896.